The town of Yusmarg is located in the Indian state of Jammu and Kashmir. Its a new destination for tourist this town is a very popular tourist destination in the region, and it is also located very close to the capital city of Srinagar. The town of Yusmarg is located in the Badgam district, which is known for its picture perfect locales and scenery. The entire region is filled with grassy pastures and the town of Yusmarg is also covered by very dense forests. Families from Srinagar normally use the town of Yusmarg as a picnic spot due to its proximity to the place it is also used by local school of vally for picnic. Horse riding is an adventure option to do while visiting Yusmarg. Besides, it is a means of transport for tourists visiting Yusmarg. Ponies can be hired directly or through the Tourist Office or Local union and on all the important locations of Yusmarg tariffs are displayed. In summer local peoples from srinagar do camping in Yusmarg and many local school do camping program here. Online Holidays also arrange for there client camping and activities. Spell bounding natural setting, adventurous trekking trails, snowcapped undulated hilly terrain and the pleasant climate during springs and summers make the trekking expedition in Yusmarg a wonderful experience. The town of Yusmarg enjoys a sub tropical climate and the basic seasons in this town are those of summer and winter. Precipitation in Yusmarg is normally in the form of mild snowfall during the winters. Summers are mild and winters in Yusmarg are very cold. (October to March) are chilly and snow bound. The minimum mercury level goes below sub zero levels and the region mostly covers receives fresh snowfall. The views of the landscape are excellent with snow covered hilly terrains. 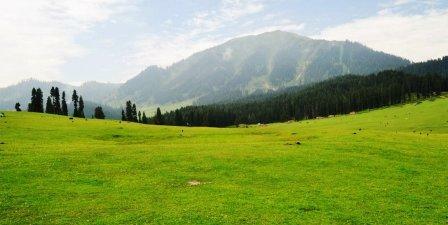 Summers in the town of Yusmarg are mild and warm, and this is a very good time to visit the place. The maximum temperature will range around thirty degrees (30°C) during this time and the minimum temperature will rage around eighteen degrees during the summer months. You need not carry protective clothing. May, June, July, August are the summer months in Yusmarg as the temperatures hover around the late twenties only during these months. Temperatures start coming down only from September..